Hayagreeva or Hayagreevar is the horse-faced avatar of Lord Vishnu, and he is the God of knowledge and wisdom. Only He knows how many times I would have chanted the “Gnana Nanda Mayam” slokam. The belief is when you chant that slokam, your memory power increases. :-) The prasadam or neivediyam offered to Lord Hayagreeva is Hayagreeva Maddi. 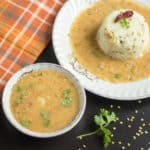 This recipe is also known by the name “Hoorana.” Even now in the Sode Vadiraja Matha, they serve this as the neivediyam for Lord Hayagriva. 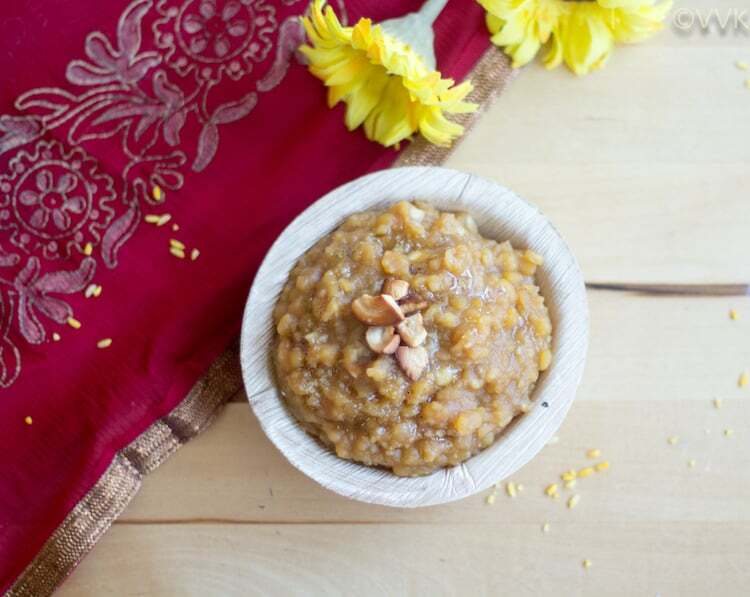 As I mentioned in the intro, it is more like channa dal halwa. Also, this is very similar to the pooranam or filling that we prepare for obbattu/poli/holige. The preparation of this recipe is super simple. 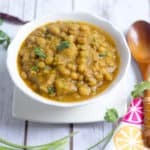 All you need to do is cook the channa dal and mash it and cook it along with jaggery, ghee, and other condiments. It is as simple as that, and it is a perfect sweet recipe for any occasion. 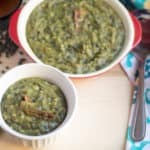 My mom keeps talking about this recipe, but we never tried it at home. 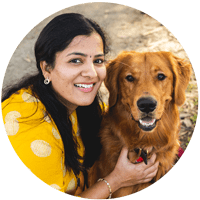 As I was exploring Mangalorean and Udupi cuisine, I stumbled upon it again and decided to try it right away. I don’t know why my mom and I kept postponing preparing this recipe. I am glad I tried, and now this is going to be a staple in our household. I made it for celebrating the arrival of our pet, Rhino and we all relished it, including our friends and their 1.5-year-old daughter. Nothing makes me happy when the little ones approve and enjoy my food. :-) :-) No, we did not feed Rhino though. :-) But I did not click pictures at that time. Thought of making it again for the New Year’s Eve and I did it and took pictures as well. Here I am sharing with you all. 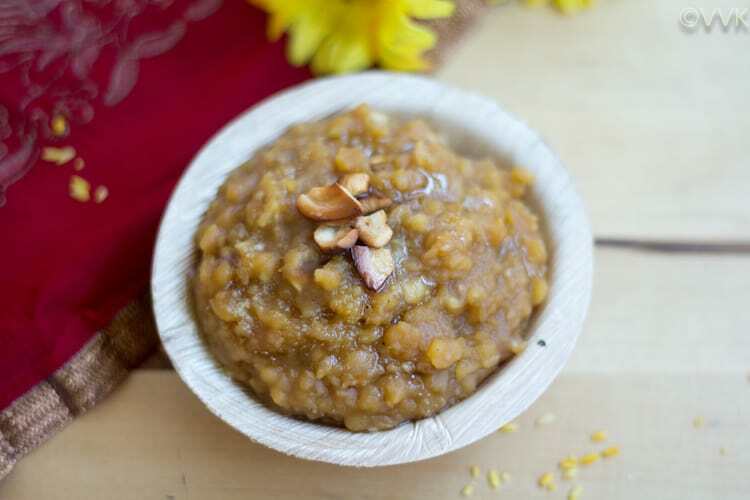 Hayagreeva Maddi Recipe | Channa Dal Halwa – A traditional Udupi dessert prepared with Bengal gram dal, jaggery, and ghee. 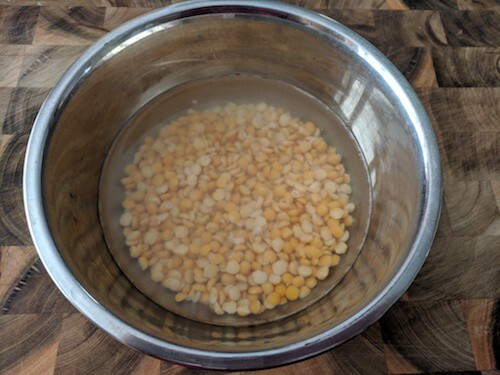 Wash the channa dal twice or thrice and soak it for 15 minutes. 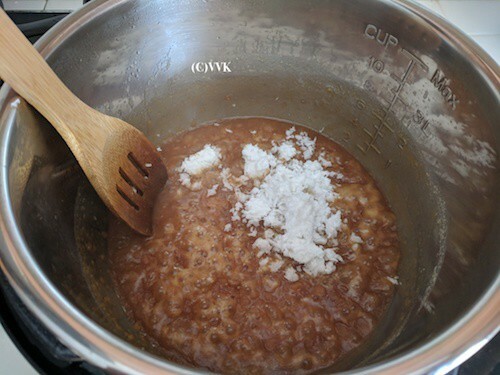 If you are using jaggery blocks, grate them or powder them and set aside 1/2 cup. Grate the required amount of coconut. 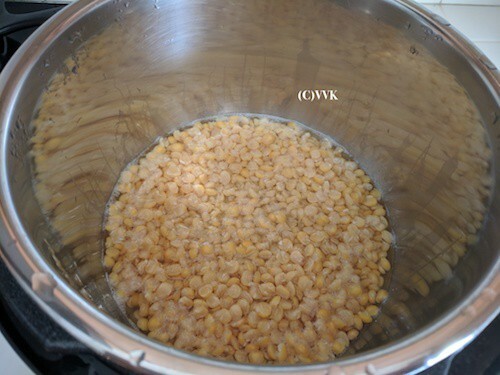 Add the soaked channa dal to the IP and add 1.5 cups of water. Set it in manual mode for 8 minutes and let the pressure release naturally. 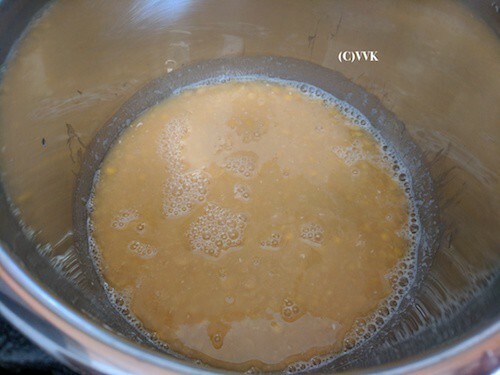 Carefully open the lid and using a masher, mash the dal nicely. Set the IP to saute mode and add the jaggery, cloves, cardamom powder. 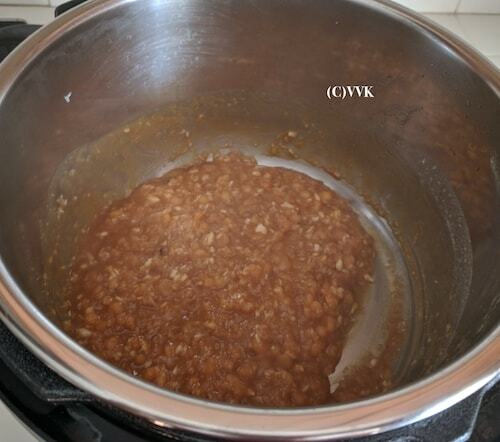 Let the jaggery melt and cook for 5 minutes. Add 2 tbsps of ghee and cook until the maddi thickens. It took me about 5 minutes. Finally, add the coconut and mix it. Let it cook for just one minute and then turn off the heat. In separate tad pan, heat the ghee and fry one tsp of cashews and add it to the maddi. Serve hot with ghee drizzled on top. 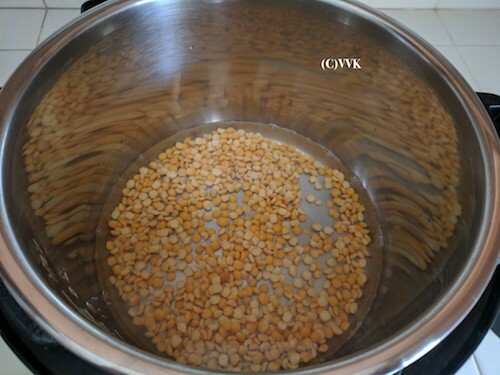 Pressure cook the soaked channa dal by adding 1.5 cups of water for up to 3 to 4 whistles. Let the pressure release. Do not discard the water and mash it nicely. In a heavy bottom vessel, add one tsp of ghee and roast the cashews first and set aside. 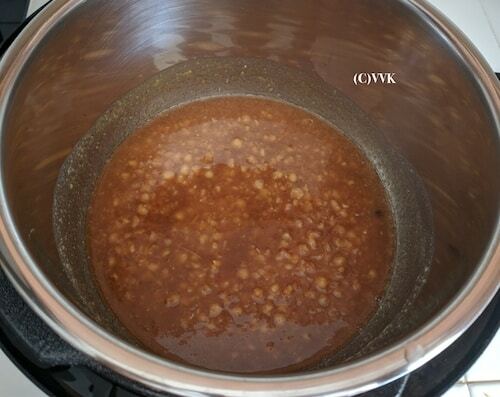 Then add the cooked and mashed channa dal, jaggery, cloves, cardamom powder, nutmeg powder. 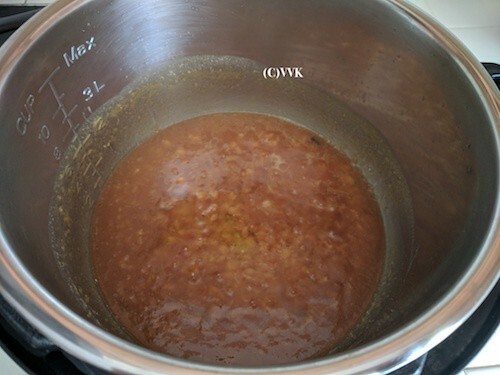 Add 2 tbsps of ghee and cook until the maddi thickens. Finally, add the coconut and mix it. Let it cook for just one minute and then turn off the heat. Add the roasted cashews and serve hot with ghee drizzled on top. 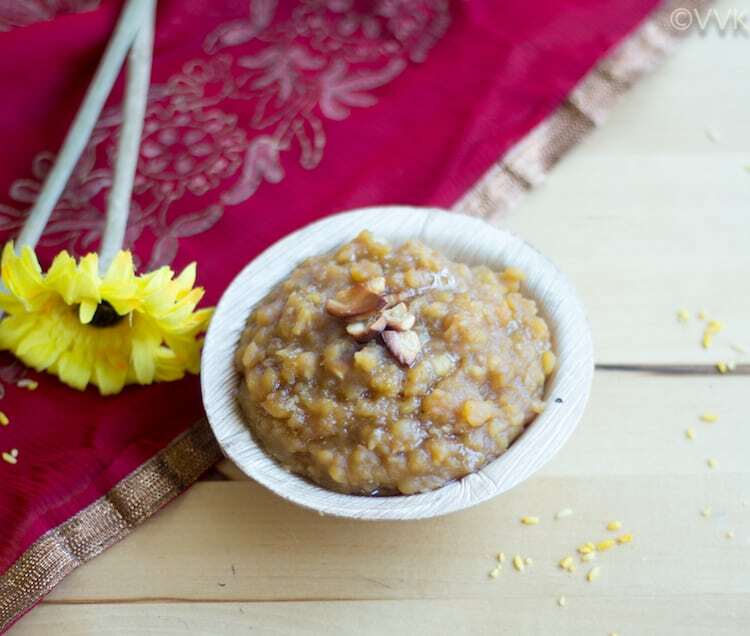 As we prefer sweeter dish, I went with an equal amount of jaggery, but you can always adjust as per your preference. 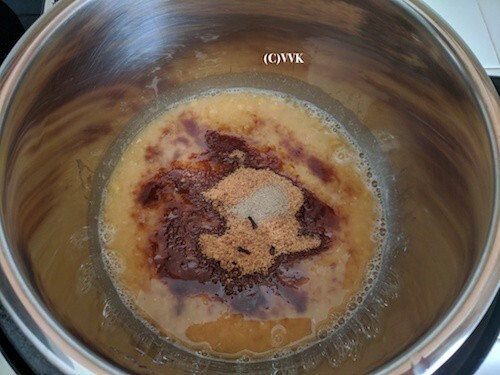 If you feel your jaggery might contain impurities, heat 1/4 cup of water and melt the jaggery in it. 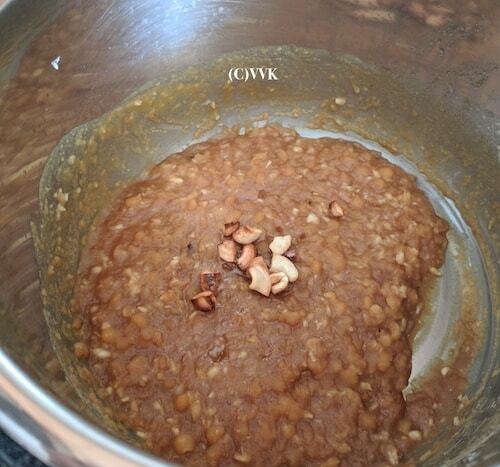 And then strain it and add the jaggery mix to the channa dal. You can add raisins and nuts of your choice for further taste. 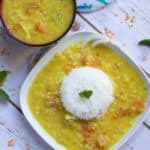 Coconut is a must, instead of grated coconut, you can add finely chopped coconut too. 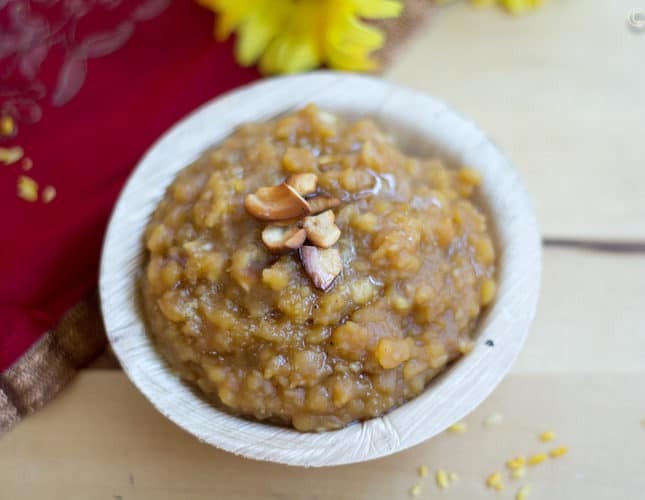 Hayagreeva Maddi Recipe | Channa Dal Halwa - A traditional Udupi dessert prepared with Bengal gram dal, jaggery, and ghee. You can add raisins and nuts of your choice for further taste. 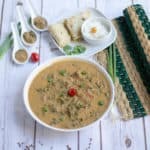 Coconut is a must, instead of grated coconut, you can add finely chopped coconut too. Happy New Year to you too. Thanks much and of course why not dessert for breakfast. Go for it. :-) Please let me know how you liked it. Thanks again. I tried it this morning. So amazing! I added some raspberries (my little nephew is crazy about them). I liked that you added cashews to the recipe. As always, everything you make is wonderful. 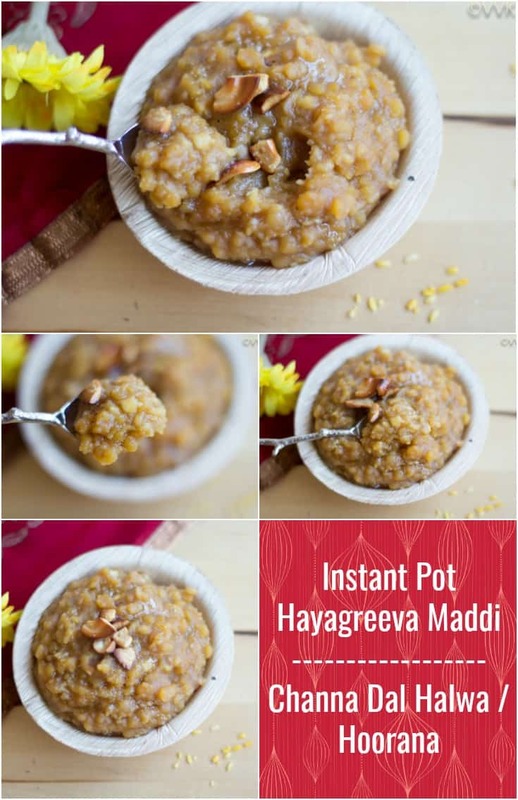 This is such a great alternative to the traditional sweet pongal recipe.The instant pot version makes it all the more appealing!